When Sarah Palin commented, at this last week's national National Rifle Association convention, "...waterboarding is how we baptize terrorists," she did worse than offend, worse than degrade human beings, worse than stir up a group of weapon-advocates. She did so in the Name of God. The fact that the NRA would allow someone to promote fundamentalism at their convention is a violation of their civic responsibility and a threat to human rights on a national scale. Most faith traditions incorporate water's restorative power. The Muslim ritual ablution of Wudu, the Jewish Mikveh ritual bath, the Hindu ritual immersions in theRiver Ganges, and the Christian practice of baptism, each point to renewal, transformation, and life. How dare the NRA tolerate -- worse, amplify -- hatred garbed in religious symbolism. Leave aside the fact, which Palin consistently ignores, that torture has been proven ineffective in acquiring actionable intelligence. Leave aside the illegality of torture, affirmed by the United States' signature on the UN Convention Against Torture, which stipulates, "No exceptional circumstances whatsoever, whether a state of war or a threat of war, internal political instability or any other public emergency, may be invoked as a justification of torture." Leave aside the partisan semantics of what actually constitutes torture in the first place. That has all been settled beyond question, and is not the source of my outrage at the NRA. Faith traditions consider torture to be a desecration of the image of God, which is why groups like T'ruah: The Rabbinical Call for Human Rights and NRCAT (National Religious Campaign Against Torture) have been marshalling religious leaders to address the moral question of torture (this week marking the 10th anniversary of the release of the Abu Ghraib photos). The National Rifle Association consistently grants fundamentalists a platform for spewing hatred and promoting the tools of war, using the Second Amendment to garner financial gain. They are using talking heads and patriotism to feed their greed, and the human cost is growing beyond 31,000 annual U.S. gun violence deaths. Fueled by demagogues like Sarah Palin, the NRA's social impact is immeasurable. "All who can protest against something wrong that one of their family is doing and does not protest, is held accountable for their family. All who can protest against something wrong that a citizen of their city is doing and does not protest, is held accountable for all citizens of the city. All who can protest against something wrong that is being done in the whole world, is accountable together with all citizens of the world. (Babylonian Talmud, Shabbat 54b)"
I am an American faith leader who holds the NRA accountable and stands in protest with countless others, reminding our country that blood saturates our streets. In a sense, Palin has led me to agree with one part of the NRA's mantra: people do kill people. To join Rabbi Creditor's email list, send a blank email to thetisch-subscribe@yahoogroups.com! Fwd: Celebrate Gala 5774 with Netivot Shalom! Celebrate Gala 5774 with Netivot Shalom! 25 years ago, a Conservative synagogue was envisioned around a kitchen table in Berkeley. From its very beginnings, this new shul was vibrant and participatory, and it steadily grew into the thriving sacred community we cherish today. Join us in celebrating 25th anniversary of the founding of Congregation Netivot Shalom at our Annual Gala, Sunday, June 15 at 6pm at our home on University Avenue. We willl also be honoring the many contributions of Milt and Marge Greenstein to Netivot. Enjoy fine food and conversation, stories and song. Formal invitations will be mailed shortly. Placing an ad in the Tribute Journal is a wonderful opportunity to celebrate this landmark anniversary and thank our honorees, while providing essential support for the great work happening at Netivot Shalom every single day. Please consider placing the largest, most heartfelt sponsorship you can. Gala Sponsorships and Tribute Journal submissions must be received by May 23, 2014. Please don't delay! Send your form in today! Download the Tribute Journal forms by clicking here. Check out the Gala 5774 page on the Netivot Shalom website for registration, ongoing information and updates! Thanks again for continuing to support our community, and we look forward to seeing you at the Gala! CNS Website! -- Make a Gift to CNS! -- CNS Online Calendar! CNS Blog! -- CNS Preschool! -- Rabbi Creditor's Blog! New Class with Rabbi Stuart Kelman! "To PAUSE AND STRETCH The Rabbi's Need for Us to Take a Breath: Kaddish and Birchot HaShachar"
A New Class with Rabbi Stuart Kelman! "To PAUSE AND STRETCH The Rabbi's Need for Us to Take a Breath: Kaddish and Birchot HaShachar"
Why so many Kaddish's? Isn't one enough? A trip through the various forms and functions. Struggling to Wake Up! The liturgy provides a response or two. Why Do we Invoke Chanukah every Time we Say Shacharit? Ah, the mysteries of Psalm 30. It would be lovely if you have good Hebrew skills, but they are not necessary for these sessions. And if you have your own siddur that you like to use, bring it along. $10 per class. No one turned away for lack of funds. Pre-registration required. Please register with Daniel at office@netivotshalom.org. Support the New Israel Fund at the Israel Day Parade: We will not be deterred. I share below an email from Dan Sotatch, CEO of the New Israel Fund, in light of vocal hatred from within the Jewish community being directed at NIF. And so, I make the following request: Please, even if you are affiliated with other Jewish organizations, join the NIF in the Salute to Israel Day Parade in New York on June 1st. They are confronted by anti-Zionist protesters as we all march for Israel, they fight for Israel's internal strength as we all march, they and we are in this together. I am a progressive Zionist who proudly supports both AIPAC and New Israel Fund as manifestations of Theodor Herzl's two-fold vision:1) securing international legitimacy for the right of the Jewish people to a state of our own (ie, AIPAC), and 2) deepening the life of our national home (ie, NIF). And, having battled against BDS in Berkeley many times, I can truly say how profoundly grateful I am that NIF does its work. Please, join the NIF at the parade and beyond. We are in this together, as a People, as a family, as a vibrant Jewish community who knows that it takes all of our voices to make a better Israel. p.s. Here is an eloquent OpEd in the NY Jewish Week by Stephanie Ives, entitled, "Why NIF is Marching for Israel." It seems silly at first. 100 men and women are planning to blow shofars outside the UJA-Federation office in New York this evening. They're calling on the UJA to exclude NIF, Partners for a Progressive Israel, and B'Tselem from New York's Celebrate Israel Parade based on the phony charge that we support the global BDS movement. The protesters seek to narrow the margins of debate about Israel. They can't seem to come to terms with the notion that, for many thousands of us, loving Israel means not sweeping Israel's problems under the rug, but rather helping Israelis overcome the most difficult challenges Israel faces: from ending the occupation, to preserving democratic freedoms, to upholding women's rights. So what's the big deal about 100 protesters in New York City, especially when the UJA, the JCRC, and so many in the organized Jewish community are standing with us? Sadly, the shofar blowers are getting support from Israeli extremists, including those in positions of real influence. Just yesterday Knesset Member Yariv Levin -- chairman of Prime Minister Netanyahu's coalition and the author of anti-democratic legislation -- wrote them a letter of support. 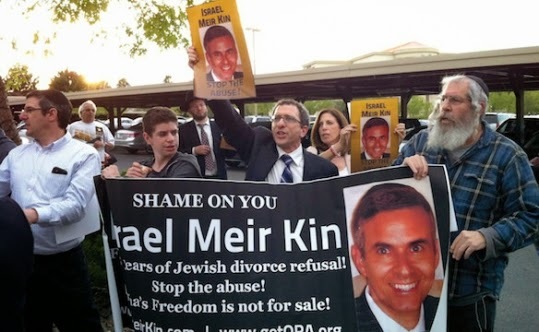 What I have come to understand is that there is a visceral connection between those protesting the UJA and the ultra-nationalist settlers who hold so much influence in the current Israeli government. Both seek to narrow the scope of acceptable discourse. Both are emboldened by the collapse of the peace process. Both want to rip Israel away from its heritage as a liberal democracy. NIF is committed to the proposition that Israel can be simultaneously a Jewish homeland and a democracy where everyone participates in a shared and just society. You and I know, however, that this vision of Israel is jeopardized by the rise of political forces bent on delegitimizing progressive Israelis, marginalizing Israel's Arab minority, and shutting out women's voices. We also know that the answer to this threat is to help ordinary Israelis fashion a better Israel. This has been the core of NIF's work for more than 30 years. The time has also come for us to step up our investment to change the public discourse in Israel and to rebuild the pro-democracy, progressive camp. You will be hearing more from me soon about the bold steps we are initiating to shift the national direction from greater exclusion toward greater openness. The noisy extremists will not deter us. Not from marching in the Celebrate Israel Parade, nor from pushing for social change. We will continue to provide the support that Israel's champions of democracy need to build a better Israel. I invite you to join us at the parade in New York on June 1st. Click here for all the information you need. Also, please take a second and forward this message to any of your friends or family in New York who are committed to Israel and to progressive values. P.S. -- This squabble over the parade in New York has been generating a ton of press. Here are a few of my top picks. This year, as every year, we gather as a larger Berkeley Jewish community on Yom haShoah, in reflection, ritual, and mourning for the 6 Million. Our community's rabbis and members will stand together, pray, and recommit ourselves to being recipients and vessels of Jewish communal memory, unspeakable pain, and of holy righteousness and resistance during the Shoah. As part of the Berkeley Jewish Community's Yom HaShoah observance and commemoration this year, Arthur Shostak, professor emeritus of Drexel University, will speak about his passionate effort to write about a critical missing piece of Shoah history before it is too late. He is focused on 'forbidden caring behavior' which Jews provided to other Jews at great risk to their lives. He calls this the 'Help Story,' and urges us to give it attention comparable to that which now goes primarily to the Nazis Horror Story. Charlene Stern, child of survivors, first-time filmmaker and member of Netivot Shalom, will interview Arthur about his journey and forthcoming book. Join us to learn what is missing from every Holocaust Museum today and why Arthur hopes we will soon change our collective memory of the Shoah for the benefit of future generations. Art Shostak is an Emeritus Professor of Sociology at Drexel University in Philadelphia, PA. He has authored or edited 34 books, and is currently writing a book about forbidden care-sharing among Jews during the Holocaust. He has related material at stealthaltruism.com, and a profile of him appears on Wikipedia. Art and his wife, Lynn, live now in Oakmont, a retirement community outside of Santa Rosa, where they have developed its first Havurah. This Shabbat: a CNS Scholar in Residence: Rabbi Jay Michaelson! 1) Erev Shabbat (Friday Night), as part of RelishDavening (5:30) and Dinner (6:30) $12 for adults // $10 for kids // $45 max/family -- Please RSVP if attending Dinner to Daniel at office@netivotshalom.org! Rabbi Michaelson's talk during dinner will be: "Evolving Dharma: How the "Meditation Revolution" is Changing Judaism." By now, it's not unusual for American Jews to meditate, to do so in Jewish contexts, and to mix and match among Jewish, Buddhist, and other forms. But how do we get beyond 'Meditation 101' and get serious about personal and social transformation? How does the current 'meditation revolution' impact how we think about Jewish practice? And how can we tailor our practice to specific, achievable goals? 2) Yom Shabbat (Shabbat morning), Rabbi Michaelson will deliver the drasha during Netivot Shalom's Shabbat davening. 3) After Birkat haMazon Learning with Rabbi Michaelson: "Discriminating in the Name of Religion: What You Need to Know"
If you've followed the news, you know that the latest tactic to limit the rights of women, LGBT people, and others is the use of "religious exemptions." Companies say they shouldn't have to provide contraception insurance because their owners don't believe in it. Hotels and banquet halls say they should be able to turn away gay people. Where did this new assault come from? In this unusual social justice text study, we will learn, interactively, about the history and theology of this movement, and understand what we can do to be aware of and combat it. Rabbi Jay Michaelson is an author, activist, and academic, currently a Visiting Scholar at Brown University, Director of the LGBT Global Rights Initiative at the Democracy Council, a Fellow at Political Research Associates, Associate Editor of Religion Dispatches magazine, and a weekly columnist for the Forward newspaper. The world we all see will only become the world we all need when each one of us pauses, takes turns describing to another the world we each long for, and if we then commit to building that collective dream, grander than any one of us has the capacity to imagine alone. Visit the Toledo Blade page and tell them to cancel Ted Nugent's appearance at their festival. this is what i wrote on the Toledo Blade page: "I'm an American faith leader, and I'm asking you to cancel Ted Nugent's appearance at your festival. His brand of hatemonger-ing tears at the fabric of our nation. We need better, and you deserve dignity, not shame." Today was a terrible day. A shotgun-wielding man opened fire at two Jewish sites in suburban Kansas City, killing three people, including a teenager and his grandfather. It's beyond awful. And totally in synch with so much that is wrong around us. Many of us are raging, but we know, deep down that healing's only going to happen when we, along with other faith communities and civic leaders, make a stand on behalf of a more noble society. If you are interested, I wrote the following two pieces in the immedate aftermath of today's tragedy. Pastor Michael McBride, my brother and teacher, reached out with comfort and strength today, as did many others. I shared with them, and I share with you, my conviction that the strength of the emerging voice for sanity on our streets depends upon the volume of the love. And, thank God, love is stronger than death. It is upon us to affirm that by loving every more fiercely, cultivating joy in the face of sorrow and healing in the face of hatred. Today was also a beautiful day, where in the midst of feverish preparation for Pesach, dozens of community members visited Shiva homes, caring for each other, comforting each other. In just a few hours, many of us will gather at shuls to mark with gratitude that we weren't included in the Plague of the Death of the Firstborn. How unfortunate that that message rings so resonant today. But it's a mitzvah to experience joy for Passover, thank God. Joy is commanded. Were it not, sometimes I'm not sure it would happen at all. So, whether it comes spontaneously or ritually, Chag Sameach! We're alive. We've emerged from slavery. We are blessed in so many ways. So, friends, let's not lose the pain, the rage, the hurt - or the joy - that life contains. Every Jewish generation is called to see itself as emerging from Egypt, from constriction to expansiveness. Some of us had a hard time breathing today, and with the love and care of a community dedicated to furthering life, to deepening joy, we will breathe deeper and deeper with each passing day. There is mourning and magic in the air. A roasted egg reminds us of the Temple's destruction, and Miriam's and Elijah's cups indicate our hope in the future, a future of peace throughout this fragile world of ours. We are, and will ever be, a People who know pain and redemption. Our journey draws from the former and demands nothing less than the latter. And so we say this year, louder than last: LeShanah HaBa'ah BiYerushalayim! Next year in Jerusalem! May life and liberation come soon and in our days, to all people, everywhere. who dream only of power. of pursuing a better world." can end the cycle of death." We're just so broken with all of this. People, this is the prayer you are called to offer right now: call the news station in your city right now. Call your leaders right now. Pray. Scream. Hug each other. Stop your hopelessness. The time to act as a noble human family is now. If you haven't been crying over dead children when they seem 'far away,' please realize that distance is an illusion. Pesach has no liberation to offer. Act now. If you don't, Pesach has no liberation to offer. Please God, watch over every child, all of us. Enough violence. Enough! I'm just so broken with all of this. People, call the news station in your city right now. Call your leaders right now. Pray. Scream. Hug each other. Stop your hopelessness. The time to act as a noble human family is now. If you haven't been crying over dead children when they seem 'far away,' please realize that distance is an illusion. Act now. If you don't, Pesach has no liberation to offer. Stephanie Ive's "Why New Israel Fund Is Marching For Israel," (April 11) eloquently articulated the textured Zionism I champion. I am a progressive Zionist who proudly supports both AIPAC and New Israel Fund as manifestations of Theodor Herzl's two-fold vision:1) securing international legitimacy for the right of the Jewish people to a state of our own (ie, AIPAC), and 2) deepening the life of our national home (ie, NIF). Having battled against BDS in Berkeley many times, I can truly say how profoundly grateful I am that NIF does its work to help more people say "yes to a better Israel." I have not always agreed with Ayaan Hirsi Ali, but her case ("Here's What I Would Have Said at Brandeis," op-ed, April 10) is made simply, passionately, and with respect for disagreement. Calls for an internal "Muslim Reformation" do resonate for me as a rabbi, as the internal reformation of Judaism, emending tradition where needed, birthed my own sacred home. Perhaps she is correct? But can a call "from the outside" be resonant "on the inside?" Melissa Nunes-Harwitt: G-d's the One who made us free / What does that require of me? Adrian Strizhak: This day is different in which way for you; how would you change to see it through? Avi Greene: I must be me in order to be free. How do I transmit this to my baby is truly the key. Jennifer Massie: Ma nishtanah ha laila hazeh? What is the next line - I can't remember... Meh. Lyn Davidson: How do we find real freedom in an over-regimented, NSA-surveillance world? Or if you want to put it another way, how do we meaningfully feel, "I personally was redeemed from slavery to the mixed blessings of technology?" Melissa Nunes-Harwitt: How do we embrace the past / without letting it hold us fast? Josh Kornbluth: If I help you find the afikomen, will your parents give me a car to ride home in? Sara Sato: If you miss the seder plate, are you considered fashionably late? Mindy Geminder: I'm the pondering child who asks so many questions, curious. But will my Pesach be extra tasty like the recipes on epicurious? Passover has been a high point of Jewish families throughout the ages, and remains so in contemporary North America. Celebration of the Passover seder is one of the principle sources of continuity that links Jews throughout the generations and around the world. At the same time, however, we know that the Jewish family today is different in many respects than it has been in the past. The people gathered around our seder tables in 2014 present a new vision of family, one that offers new possibilities as well as new challenges. At The Jewish Theological Seminary, we are thinking creatively about these changes and how to inspire Jewish families, in all their varieties, to see themselves as part of these age-old and ever-changing dramas of Jewish history. We invite you to join us in raising the questions that need to be asked and answered. Let’s take the occasion of this most special family gathering to focus loving attention on the changing character of our families. I would like to express my appreciation to Senior Rabbi Michael Siegel of Chicago’s Anshe Emet Synagogue and Rabbi David Hoffman of JTS for their help in the development of this Passover seder supplement. We wish you a sweet and joyous holiday. We are asked to see ourselves—on the most personal level—as characters in the story of the Jewish people. By retelling the Passover story, expounding on it, and relating it to our own experiences, the hope is that we will enter into the story, make it our own, and join the Jewish people’s struggle to redeem the world. The logic goes that if we can write ourselves into our people’s past, we can become authors of our people’s future. But finding ourselves in the story is not always easy. And if there are impediments to seeing ourselves in this story, the barriers may increase exponentially when trying to see our contemporary families within traditional tellings of the narrative. Can the modern Jewish family see itself within the continually unfolding story of the Jewish people? The answer, of course, is that it can and must. We suggest that, given the variety of Jewish families today, the traditional questions of the Passover seder should be supplemented by others that bring these changes in the nature of the Jewish family to full consciousness, and make the family and its story an integral part of discussion at the seder table. How does the family around this Passover table differ from the one you remember at seders in your youth? Are there different cultures represented at your table? Do the members of these cultures relate differently to notions of oppression and freedom, memory and ritual, food and song? Is everyone at the seder Jewish? Was that true when you were growing up? Do the Jews at your table relate differently to the Passover narrative than others? Are there Jews-by-choice at your seder table? How did the Passover story figure into their decision to become part of the Jewish people? Do any members of your family—or you yourself—have difficulty in making the Passover story their/your own? What gets in the way? Do you feel like an “insider” or “outsider” in relationship to “the Jewish community,” however you understand it? What can the Jewish community and synagogues do to better engage people who see themselves as outsiders? How might you and others at the seder table help this process? How has your relationship to Passover been affected by your personal or family situation: Your marriage, for example; or your divorce? Your decision to have a child as a single parent? Your coming out as LGBTQ? Your decision to remarry, and take on responsibility for your new partner’s children? Your decision as a Jew to marry someone who is not Jewish? Your decision to marry a Jew? For members of our communities, these are some of the most urgent questions. The future of the Jewish people depends upon us meaningfully addressing the new questions that address modern Jewish families. They deserve to be answered with the same thoughtfulness, sensitivity, and creativity that the ancient Rabbis brought to the pages of the Haggadah. The questions that we raise, and the answers that we offer, will determine whether another generation can leave that narrow place we call Mitzrayim [Egypt], and take part in the Jewish journey of redemption. B’chol Dor Vador: In each and every generation, all our families must feel as though they had personally been redeemed from Egypt. B’chol Dor Vador: In each generation, it is our responsibility to make a place for every person who wants a seat at the table of the family of Israel, and help them feel personally part of the story of the Jewish people.Print a copy of the Passover seder supplement. Most of the time my hashkafah/worldview is based upon respecting different opinions. But someone just commented on a thread about Meir Kin's abuse of his ex-wife by not providing her a get (religious divorce), and labeled those trying to free this person from her abusive former husband "self-appointed saviors." To this commentator, I can only say the following: HOW DARE YOU. A Jewish man in an Orthodox community cannot step into the shoes of a disempowered Orthodox Jewish woman and therefore has no right to contest those who champion her dignity. Adding to the wrongness of the commentator is his glossing over the fact that most of the activists are Orthodox Jews working towards human justice and halachic parity within the Orthodox community. Pesach Resources: Davening Times, Pesach Kashrut, Chametz Sale, Seder Kits & More! Davening Times, Pesach Kashrut, Chametz Sale, Seder Kits & More! Make a Gift to CNS! Here are some links to resources to deepen your Pesach experience! The CNS Pesach Kashrut Guide! How to do the "Search for Chametz"
The G-dcast Exodus Scavenger Hunt App!